In stock -This product will ship today if ordered within the next 8 hours and 10 minutes. 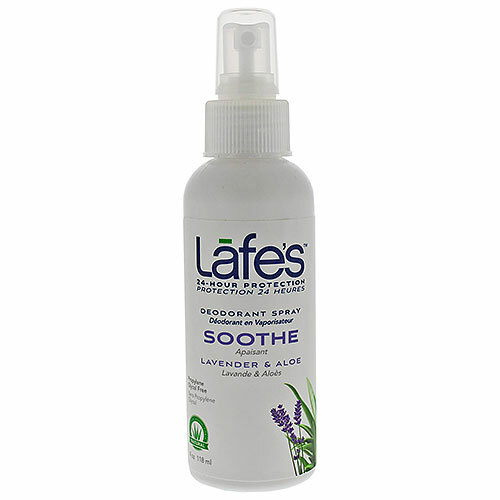 Lafe`s Deodorant Spray Soothe with Lavender and Aloe. 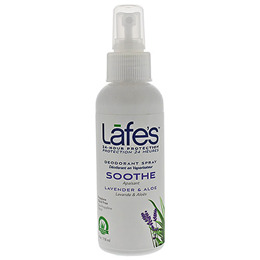 Lafe`s natural deodorant in an effective spray formula. Lafe`s lavender scented organic deodorant is made with lavender essential oils to keep you calm, relaxed, and feeling fresh. Lafe`s natural botanical essential oils fight odour-causing bacteria without the use of harmful chemicals. This natural deodorant formula is made with certified organic ingredients and is aluminum free, gluten free, and propylene glycol free. Spray 5-6 times under each arm or on feet. Below are reviews of Lafe`s Spray Soothe Deodorant - 236ml by bodykind customers. If you have tried this product we'd love to hear what you think so please leave a review.